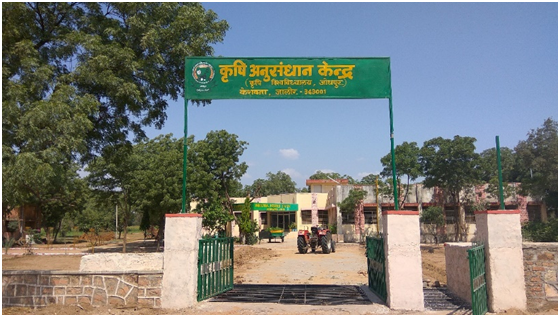 Agricultural Research Station, Keshwana, Jalore is working under the jurisdiction of Agriculture University, Jodhpur. It was established in 1988 under National Agriculture Research Project (NARP) funded by ICAR, New Delhi with one substation at Sumerpur, district Pali. These stations were established with the objective of overall development of agriculture and animal husbandry in Transitional Plain of Luni Basin (Zone IIb) of Rajasthan. ARS - Keshwana is situated on the way from Jalore to Barmer at about 17 km distance from Jalore. The distance of this station is about 168 kms from Jodhpur and 420 km from Jaipur. The site is located at latitude 25023.115’ and longitude of 72030.726’E, elevation 149.9 msl.The Zone IIb lies in south-west corner of Rajasthan. East-west it spreads from foot hills of Arawali to the border of Barmer district, whereas north-south its boundary touches Ajmer district in the north and border of Gujarat in south. This zone includes all tehsils of district Jalore and pali, two tehsils of district Jodhpur (Bilara and Bhopalgarh) and three tehsils of district Sirohi (Sheoganj, Reodar and Sirohi). River Luni and its tributaries or the major drainage system and draining in the runn of kutchh. The climate of zone IIb except some part of district Sirohi is dry with large variation in temperature and rainfall. During summer season highest temperature remains between 350-450 C and during winter season the lowest temperature go up to 10-50 C. Average annual rainfall varies from 330 mm in tehsils of district Jodhpur to 490 mm in pali district; however it is 421 mm in Jalore and 450 mm in tehsil of district sirohi, The rainfall is highly erratic and variable in space and time. Avarage number of rainy days varies from 19-26 days and relative humidity remains between 57-69% during rainy season.